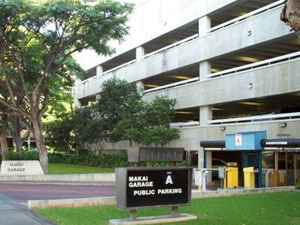 Operates a financially self-supporting parking program by assessing fees to provide and maintain parking facilities; to assign and control parking spaces for employees and the public; to direct traffic and provide security patrols in parking facilities, and to enforce parking rules and regulations. Temporary green parking permits are issued to assignees, employees, consultants or contractors for periods not exceeding 30 days. Temporary permits are valid for only for the lot, date(s), and vehicle(s) specified on the permit. Parking fees are assessed based on the justification and need for the temporary parking permit. WHITE Civic Center Complex permits are issued to agencies located physically outside the state capital complex. State employees may use these permits when conducting official state business with agencies located within the state-capital complex. There is no charge for the permits, which are valid for two-hours, in the state metered or state attendant controlled stalls. Four (4) hour white civic center permits are also available for a monthly fee of $15 for agencies who require more than two-hours at a time to conduct business within the state capital complex. These permits are issued to employees, servicing agents, and other individuals or organizations approved by the Comptroller for temporary parking assignments. Parking fees are assessed based on the stall type and location. These single use prepaid parking permits are issued to state agencies only in quantities of 25-FULL DAY (10-hour) or 50-HALF DAY (5-HOUR) permits at a cost of $100 per booklet. The permits are intended for use by participants who are attending: training classes, seminars, meetings, conferences and other state functions held within the state capital complex. The permits are valid for only the date and time indicated on the tag.